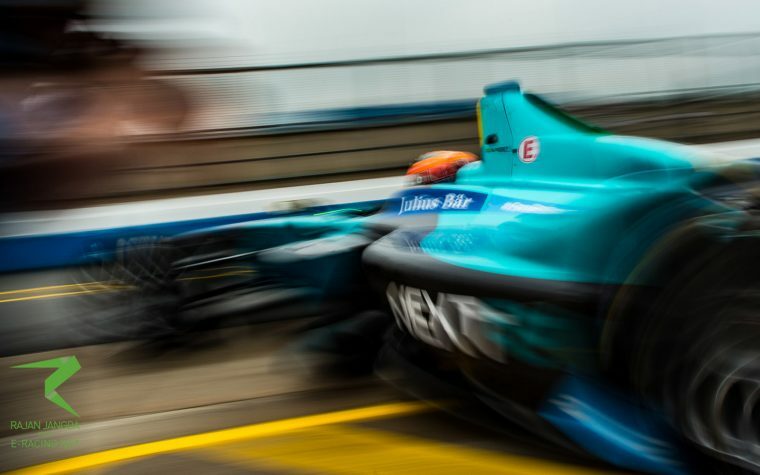 NEXTEV locked out the front row of the grid for the first ePrix of the season after a drama filled qualifying. Nelson Piquet JR beat his team mate to take his first ever Formula E pole position, while rookie Jose Maria Lopez impressed in P3. It was a bit of a slow start, with the first group not breaking into the 1:02s. Nico Prost was the first man to put in his 200kW time, a 1:03.759, losing around a second with a small mistake at the end of his lap. The Frenchman blamed the slower lap times to the changed chicane, where a sausage kerb was removed, and a dirtier track. Surprisingly, the teams had not been told about the changed chicane before the qualifying session. Unsurprisingly, Prost wouldn’t be the only one to have trouble with the new layout. Nick Heidfeld, Adam Carroll, and Stephane Sarrazin followed him across the line, but none were able to go faster. Loic Duval, after his difficult free practice session, was flying around the short Hong Kong track. Duval was more than a tenth of a second faster than Prost, and looked like he was going to try a second flying lap, not normally seen in Formula E qualifying. It looked like a scruffy lap, though, and Duval pitted before the end, bringing an end to the first qualifying session. Lucas Di Grassi, Sam Bird, Antonio Felix Da Costa, Ma Qing Hua, and Oliver Turvey were the next group out, and the next group to face the new chicane. Di Grassi, at the top end of the pit lane, was the first man out on track, and the first man to move onto his 200kW lap. In the first sector, Di Grassi was down on Duval’s fastest time on his flying lap, but was pushing to make up for that on the rest of the lap. Pushing a little too hard, perhaps. The Brazilian made a small mistake at the changed chicane, hitting the wall and damaging the front left corner of his ABT Schaeffler Audi sport car. The red flag was brought out as Di Grassi’s car stopped on track with just under three minutes left on the clock, the four other drivers in the group returning to the pits. When the green flags returned to the track, the four remaining drivers were straight onto the track, enough time for a warm up lap and a fast lap. Through the sector times, it looked like it was going to be a battle between Bird and Turvey, the Brits flying. Bird crossed the line first, bettering Duval’s time by nearly four tenths of a second. Moments later, though, Turvey crossed the line. The NEXTEV driver was 0.027 seconds faster than Bird, putting him top with a 1:03.231. Nelson Piquet, Felix Rosenqvist, Mitch Evans, Jean-Eric Vergne, and Robin Frijns were out in the next session. Piquet and Rosenqvist were both flying early on in their flying lap, both of them faster than Duval in sector one, the Brazilian the faster of the two. The Mahindra driver lost time in the latter stages of the lap, eventually going third, but was pushed down when Piquet flew up to first, 0.132s faster than team mate Turvey. There was more chicane-drama behind the pair of them, though, yellow flags in turn two. Cameras flicked over to find Frijns’ MS Amlin Andretti car buried in the wall at the corner. The red flag was brought out with just over two minutes left on the clock. Vergne and Evans were both allowed to head back out after a long delay to repair the damage, but there wasn’t much time for two warm up laps. They were both left with cold tyres and brakes, leading to scruffy laps for both drivers. Vergne could only make sixth, Evans twelfth. With all the delays, it was announced super pole would be cancelled, meaning Piquet’s fastest time would put him on pole, if nobody in the final group could beat his time. It was a massive turn around from his disappointing season two. It was a drama free final session for group four: Maro Engel, Jerome d’Ambrosio, Jose Maria Lopez, Daniel Abt, and Sebastien Buemi. It was a tidy lap for Buemi, but all the way through the lap he seemed to be losing time to the NEXTEV drivers. When he crossed the line, he could only manage a fourth, behind the NEXTEV duo and Bird. But Lopez has been a qualifying star in other championships and, despite being a rookie, he was flying around the short Hong Kong track. The Argentinian crossed the line third, just ahead of his team mate, bumping Buemi down to fifth. Abt would qualify seventh, Engel twelfth. The eventful qualifying session did not only remind the Formula E fans of why they missed the all-electric series so much during the off-season, but also sees them in confusion. 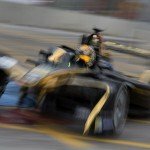 During an interview, Faraday Future Dragon Racing team boss Jay Penske mentioned a three place-grid penalty for Duval for speeding under red flags in yesterday’s shakedown. This penalty has so far not been discussed publicly and it remains to be seen whether Duval will actually start the race from P8 or not. Editor’s note: The track modifications between FP2 and qualifying can simply be described as ridiculous. Not only stated both teams and drivers that they had not been properly notified about the changes at turn 4, but they complained about the fact that the transformation “changed the dynamic of the middle sector”, according to Bird. His fellow colleagues could not agree more, with da Costa saying “I don’t know why they changed the track five minutes before we head out into qualifying” and Frijns – one of the victims of the turn 4 modification – expressing a similar sentiment, stating: “It was not a fair move from the race director”. 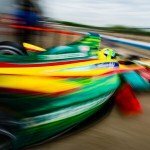 Di Grassi, like Frijns ruining his qualifying in said turn, even went as far as saying that this change compromised his championship from the beginning. While the qualifying in the streets of Hong Kong did provide a lot of excitement, the fans would have surely appreciated a qualifying whose outcome was not heavily influenced by sudden track modifications even more. Main image courtesy of Rajan Jangda. Other image courtesy of FIA Formula E Media and Rajan Jangda.